Investors will get a welcome health-check on the U.S. economy this week as markets fret it’s looking increasingly recession-prone. The next seven days are packed full of key data with reports on retail sales and manufacturing setting the tone on Monday right through to the March jobs report on Friday. The median of forecasts in the Bloomberg survey is for payrolls to rise 175,000 after a disappointing reading of 20,000 for February. The reports will help inform Federal Reserve officials, who’ve become even more cautious of late when discussing the outlook as some futures pricing indicates a chance they could cut interest rates this year. The week kicks off with retail sales for February after the two prior reports conflicted by showing a December collapse and January stabilization in the largest section of the U.S. economy. A report from the Institute for Supply Management manufacturing the same day and another from the government on capital goods orders Tuesday will shed light on how busy factories are. The ISM manufacturing index, measuring everything from production to inventory, has eased since August as tariffs on foreign goods from countries including China fanned uncertainty and weakened global demand for American products. As for the payrolls report, it’s forecast to show that the labor market rebounded from February’s surprise weakness, ensuring the first quarter ended with unemployment at 3.8 percent, matching the lowest in nearly five decades. One big risk hanging over the outlook is a trade war with China now in its eight month, and talks resume on Wednesday with Vice Premier Liu He’s trip to Washington. 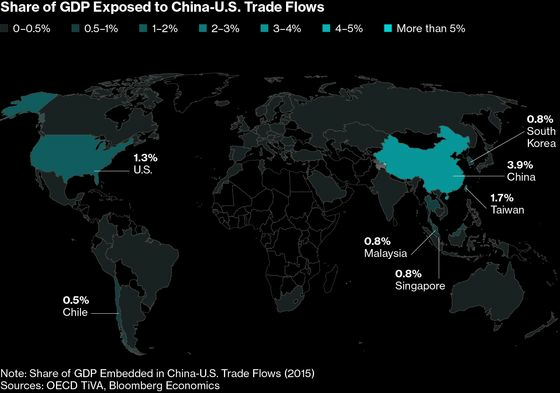 The trade talks will draw the focus for China watchers. Australia’s government will release its budget plans for the next fiscal year on Tuesday, with tax cuts and a spending blitz in rural areas expected as it seeks an unlikely come-from-behind victory in elections expected in May. That fiscal loosening may help the nation’s central bank -- which will also set monetary policy on Tuesday -- resist pressure to ease as home prices fall and consumers turn skittish. 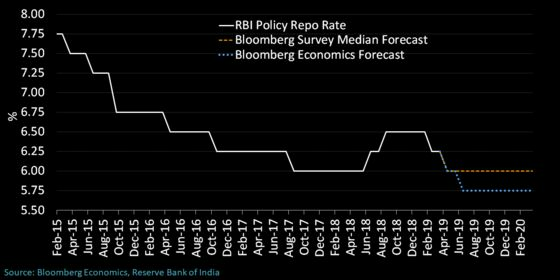 India’s central bank is in action on Thursday -- with sliding inflation making a follow up interest rate reduction possible there. Minutes of the European Central Bank’s March decision will potentially shed light on a discussion that may have begun the countdown toward President Mario Draghi’s announcement last week that officials should study ways of softening the impact from negative interest rates. 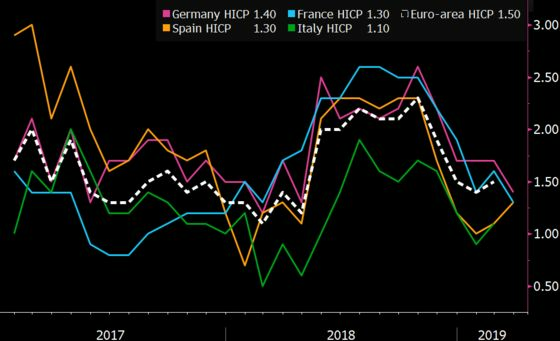 That release on Thursday follows hard data for the region on inflation due on Monday, likely to underscore the ECB’s continuing difficulty at fostering price growth. In the U.K., manufacturing and services purchasing managers indexes will provide a reading on the pulse of the economy as it palpitates in the prelude to a hard Brexit or some less ominous solution to the standoff in Parliament. Russia will announce its fourth quarter gross domestic product figure on Monday amid growing skepticism over the quality of the data, while Ghana and Uganda central banks meet to set interest rates. Poland and Romania also make monetary policy decisions. Brazilian President Jair Bolsonaro is on an official visit to Israel, but investors back home will be gauging his administration’s ability to negotiate a key pension bill with Congress. 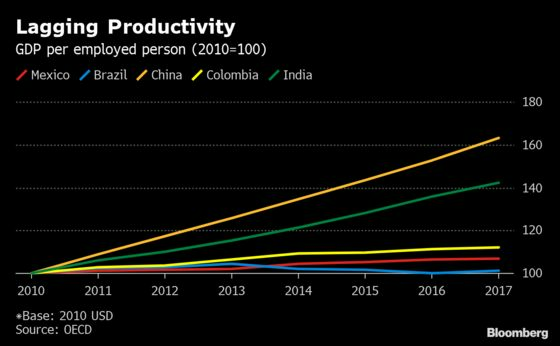 Uncertainty about structural reforms has hurt Latin America’s largest economy in the beginning of the year and may be evident again on Tuesday, when industrial production data for February is published. In Mexico, March consumer confidence due on Thursday is expected to remain near all-time highs, although its impact on retail sales has been so far limited by the highest borrowing costs in a decade. In Colombia, minutes of the central bank’s latest monetary policy meeting due on Monday may shed some light on how much longer the bank will maintain its “slightly expansionary” policy stance. Up in Canada, Bank of Canada Governor Stephen Poloz on Monday gets his first opportunity since last month’s rate decision to comment publicly on market bets that his next move with be a rate cut.